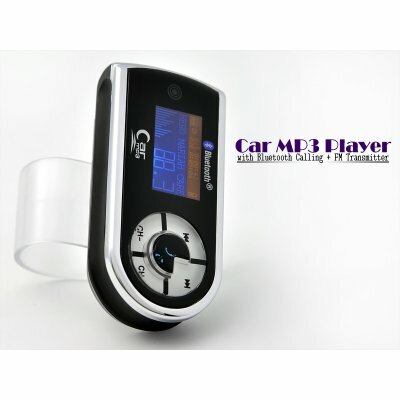 Successfully Added Car MP3 Player with Bluetooth Calling + FM Transmitter to your Shopping Cart. Enjoy your favorite MP3s as well as hands-free cellphone communication while driving with this Car MP3 player with Bluetooth calling and FM transmitter. So how does it work? It’s easy, simply plug this MP3 player into your cars' cigarette lighter socket and tune your FM radio to match the same frequency of the MP3 player. Then hit the play button and you’re good to go. This device also comes with Bluetooth functionality and a built in MIC so you can even use your cars’ stereo system to enjoy safe hands-free cellphone conversations while driving. This car MP3 adapter comes with 2GB of memory for storing hundreds of MP3 files, as well as a mini USB port for easily loading new songs from your PC or MAC computer. This MP3 car adapter also features an illuminated OLED screen so you can use it at night, large easy to press buttons for people with larger hands, and an adjustable bracket so you can angle this device exactly where you like it. This device is not limited to car use either. That’s because this MP3 player comes with a built in battery that will keep you rockin’ for hours. Simply slide the MP3 player out of its holder and clip it to your shirt, jean pocket, or backpack. The lightweight and compact design makes it perfect for jogging or weight training at the gym. And the 3.5mm headphone jack ensures compatibility with your favorite set of Hi-Fi earbuds or headphones. If you’re looking for a small yet powerful car MP3 player that can be used while on-the-go then the CVRA-CS51 is the ideal device for you. And with the added bonus of hands-free Bluetooth calling and 2GB of memory you really can’t go wrong. Order now while supplies last and we’ll ship your order out within 24 hours and even include our full 12 month hassle-free warranty. Please read the entire user manual for the best user experience. Bluetooth pairing code is 0000. What is the Bluetooth passcode? The Bluetooth passcode is 0000.